Hudson Headwaters Health Network is a not-for-profit that provides access to health care services through 17 community health centers in the North Country of upstate New York. 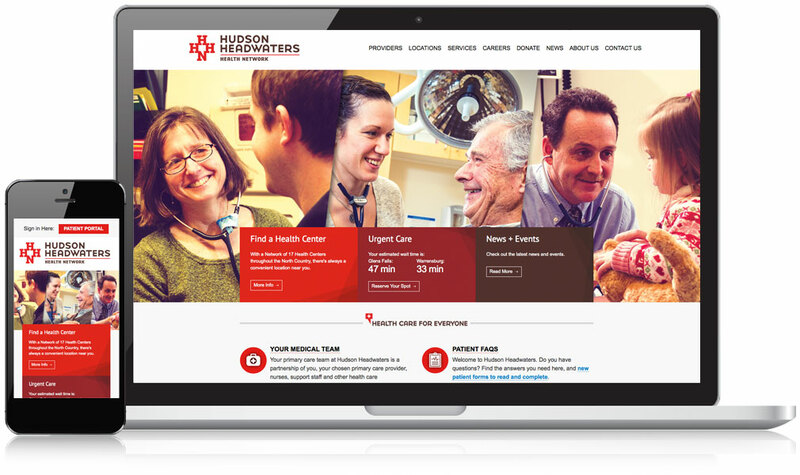 They needed a modern healthcare website to make it easier for patients to find health centers and providers, to encourage the community to get involved, and to show what HHHN is all about. Mannix Marketing teamed up with Trampoline Design on a website design and development project for one of the region’s leading non-profit healthcare organizations. As an organization that’s dedicated to providing better access to health services, it’s only fitting that HHHN’s website makes it easy for visitors to access information about the health network. A streamlined navigation menu displays links to the most important sections of the website so that visitors can quickly and easily find the information they need. 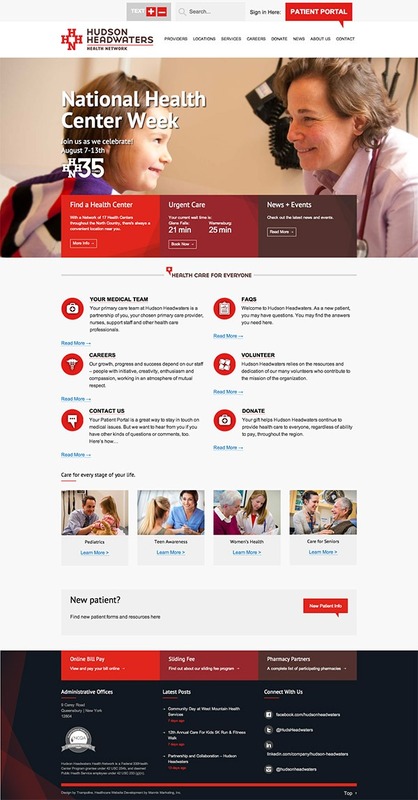 From the home page, HHHN also includes options that help visitors find a health center, reserve a spot in urgent care, access the patient portal, and more. Current and prospective patients can find nearby providers and health centers faster than ever by using the search form or browsing a list of providers and health centers. The website also features photos and brief biographies of providers along with an overview of their specialties, adding a human touch to the organization’s online presence. Recruiting plays an critical role in HHHN’s mission, so the website helps prospective candidates discover new career opportunities. Candidates can browse listings that HHHN has posted to the website and even apply for current opportunities online. Visitors can easily access this responsive website from desktops, tablets, or smartphones, as the website’s content automatically adjusts for optimal display on different screens and devices. Because HHHN serves people of all ages, it’s important that their website be user-friendly for a wide range of populations. The ample whitespace surrounding the text copy, images, icons, and other contents on the page provides more breathing room for an easier reading experience. Today, HHHN has greater control over the content on their website, allowing their team to modify text copy, add pages, upload new images, post blog articles, and incorporate video into the website through a user-friendly content management system.